Kathleen Pitz (Katie) will be working with Francisco Chavez and his lab. 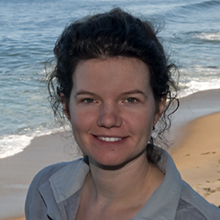 Katie earned her PhD in Biological Oceanography, from the Joint Program in Oceanography/Applied Ocean Science & Engineering – Massachusetts Institute of Technology & Woods Hole Oceanographic Institution. Katie has received several awards, including a WHOI Coastal Ocean Institute Research Proposal Award, a WHOI Ocean Ventures Fund Recipient, and an NSF Graduate Fellowship Honorable Mention.